Fifty-four-year-old M Mahadevan is today known not only in India, but overseas too, as 'Hot Breads Mahadevan'. His journey from being a professor at the Madras University to an entrepreneur in charge of a multi-million-dollar business spanning various countries can only be described as amazingly inspiring. But the man is still the same: simple hearted and hard working. Here is his interesting story. I come from a simple town in Tamil Nadu called Udumalpet; it is 65 kilometres from Coimbatore. Though both my parents were doctors, I took my post graduate degree in Commerce. My interest in the hotel industry began after reading Arthur Hailey's Hotel. I had just joined college then. In hindsight, I feel what attracted me to the hotel industry was people; I love meeting people. My parents also met people, but only those who were in pain and misery, and I want to meet people who are happy. 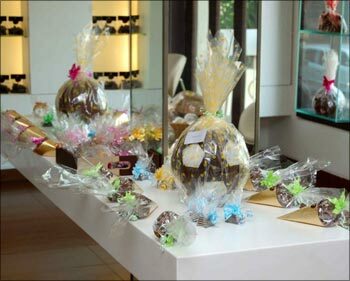 Those who come to a bakery or restaurant are always in a joyous mood. I came to Chennai in 1979 as an Assistant Professor at Madras University. I taught Marketing to management and accounts students. That was during daytime. The passion to be in the hotel industry was so intense that I started working for four hours at Hotel Ambassador Pallava at night to learn more about the industry. I was a trainee, a bell boy, a receptionist: everything. So, you can say I was a professor during day time and a bell boy in the evening. 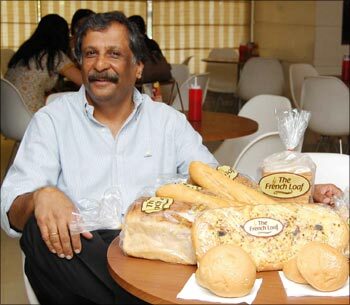 Image: M Mahadevan with the goodies prepared at his Hot Breads bakery. In those days, no girl from any good family in Chennai would marry a man who worked in hotels! In short, my mother didn't like it a bit. But I told her, 'One day, I will become the owner of a hotel and give employment to many people.' She was happy to hear that part. I met my partner while I was working in the hotel, and we started our first take out -- at the Tic-Tac unit in Chennai. The unit was selling north Indian food and I started a Chinese take-away there. I opened my kitchen with Rs 60,000, and it opened at 5 p.m. and closed at 11.30 p.m. That was the time Chinese food was a craze among the people here. One of the persons who came to take the food was building a commercial tower and asked me whether I was interested in taking up a place there. That was how the restaurant Cascade opened. We served Chinese, Thai, Malay and Japanese cuisine. Those who sold Chinese had red and green as the interiors, but I wanted something different. I got Parmeshwar Godrej from Mumbai through my neighbour, who was artist M F Hussain's son. And I told her I wanted all white and blue. I wanted my restaurant to look different and the interiors became a selling point. Many came to see the interiors. From then on, business roared. That was in 1986. My partner said, 'You are crazy. The success of Cascade has got to your head!' So, whatever money I had (Rs.300,000) in Cascade, I took with me, and decided to start my bread unit on my own. I got Rs 800,000 as loan. 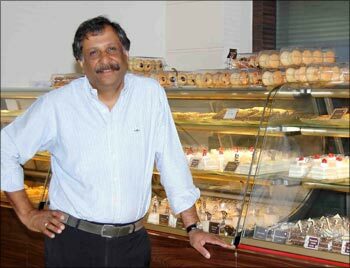 I started Hot Breads with Rs 11 lakh (Rs 1.1 million) in 1989. We had to import bread making machines in those days. It was the license regime then -- not like today. I gave the project plan and it took four months for the committee to take a decision though they met every month. Once you got the license, it was mentioned in it what machine I was to import and at what cost. Not even a dollar more I was supposed to bring in to the country! I was not looking at selling just bread alone but curry buns, pastries, pizzas, burgers, etc. Bread was only a trap for the customer to come inside. We took a bun, filled it with curry and made it a curry bun. We filled chicken tikka inside a Croissant. I got the idea to make these things Indian after I saw what Japanese did to their bakery items. Our curry buns are a big hit even in Paris. People used to crowd in our unit at Alsa Malls in Chennai. From day one, we started making profits as the concept was unique and the product tasty. It was a perfect cocktail. We broke even in the first year itself and never looked back. 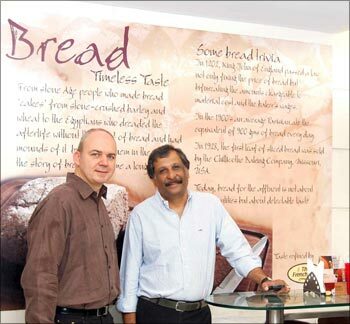 In the third month itself, people from Kochi and Bangalore came to me to start Hot Breads units there. Soon, I came to be known as 'Hot Breads Mahadevan'! 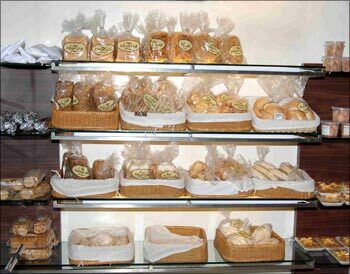 Image: Some of the breads, pastries, etc on display at a Hot Breads outlet. I had around 12 units in India by then. We went to Dubai, started a unit there and it was a huge success. But we had to close it down after a year as it became a no-parking zone. When we were about to wind up, I was a bit sad that my overseas venture did not take off. We soon got a contract from a union co-operative society. From day one, it was a roaring success. It was a Godsend. Like they say, when one door closes, ten others open. For 14 years, we were at the same place. Only last year, they replaced us but then now, we have so many other units in Dubai. The strangest demand we got was for Arabic bread. A gentleman came to our shop and said, if you don't have Arabic bread when you are here, shut your shop'. The very next day, I hired a Lebanese guy and we started making Arabic bread. Kids might like sandwich bread, but elders still prefer Arabic bread. But what is catching up is the curry-flavoured bread all over. Image: Hot Breads is a booming business. The stringent rules forced me to be a Non-Resident Indian. Anyway, I would be away for more than 180 days to build my units. The profits you make internationally are not taxed here. The profits I made were put back to start more units abroad. The rules are different now. But I am happy that I chose the NRI route. In the last 20 years, I have opened -- with help from others -- 130 bakeries in 16 countries: the United States (New York and San Francisco), Ghana, France (Paris), UAE (Dubai), Botswana, Kuwait, Muscat, Singapore, Malaysia, the United Kingdom (London), etc. Now we are going to Australia. But the market in India is booming and we have 68 units here. We started with Rs 60,000. Now, we make around Rs 100 crore (Rs 1 billion) in India and internationally around Rs 120 crore (Rs 1.2 billion). Image: M Madhavan with a friend. I believe in the hand of God. You have to be at the right place at the right time, and God's hands have to be there to help you and guide you. Wherever I went -- Dubai, Botswana, San Francisco -- a force took me there. My ideas worked because they came at the right time. Instead of 1989, if I had opened in 1980, I would have gone bust. Doing your homework is very important which is studying and understanding the market. I have made many mistakes, but I try to learn from them. We keep learning. My advice to budding entrepreneurs is, innovate and think different. Don't follow anyone's footsteps; leave your own footprints for others to follow. Try to be lean and mean. Don't take your customers for granted. Unless you have passion, you will not be able to carry a smiling face. More than hard work, it is the passion that you need to succeed. I have 3,000 boys working for me in India. I started with 14 boys in Dubai, now we have more than 1,000 boys working abroad. I love my boys, but I am a hard taskmaster. I don't accept laziness. I don't like procrastination. I drive them crazy, I know. Some of my boys run to my mother and complain about me! We started 'Winners' in Chennai to teach poor, bright boys to bake. When you teach them a skill, you give them a life. My happiness is not in turning my Rs 60,000 into Rs 120 crore. I am happy because I give employment to 3,000 boys in India. India needs not one but 10,000 Mahadevans to give employment to thousands of people. What I have done, anybody can do. I am an ordinary guy from a small town, but I had big dreams and commitment. 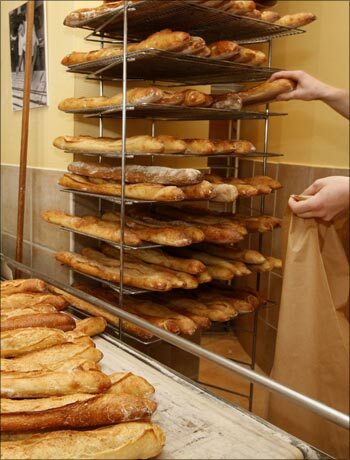 Image: A worker displays baguettes (French stick), bread made with organic flour, at a bakery in Paris.